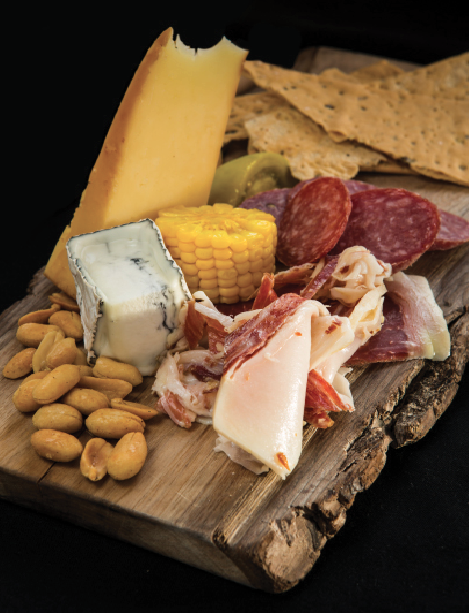 A good Charcuterie Board will always have a few main ingredients: cheese, meat, and crackers or bread. The best trays also include something pickled or tart, or something sweet. You want to include about 2 ounces of cheese and meat per person. 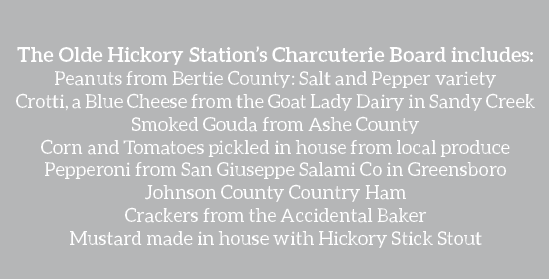 The Olde Hickory Station provided us with this excellent board, crafted entirely out of local ingredients. It’s a great starting point, but you have so many choices. It’s easy to get intimidated. Cheese: it’s hard to go wrong, but it’s a good idea to sample cheeses from several categories. Cheese tend to be aged (gouda, cheddar), firm (parmigiana-reggiano and the like), crumbly (goat cheese, feta), creamy (brie or brillat-savarin), or blue (stilton or gorgonzola). Charcuterie: Again, you’ll want to sample different textures. Include some hard meat, like salami, but also something creamy like pate, and then a dry cured favorite. I’ve never made a board that didn’t include prosciutto, and I’ve never had a piece left at the end of the evening. It’s like Country Ham, but sliced more thinly, and it’s a true favorite. Bread or Crackers: This is important because it’s how you’ll get the cheese and meat to your mouth. Crispness is as important as flavor here. I usually make sour dough toast points and include crackers as well. I avoid heavily flavored crackers because I think the taste should come from the meat and cheese. Extras: This is what makes a good board stand out. I include something pickled (carrots are great choice, but any pickled vegetable will work), something sweet (fruit, like grapes or pears, is a great choice, and so is local honey), and some mustard based sauce. I usually put spicy whole grain mustard, but the options are endless. 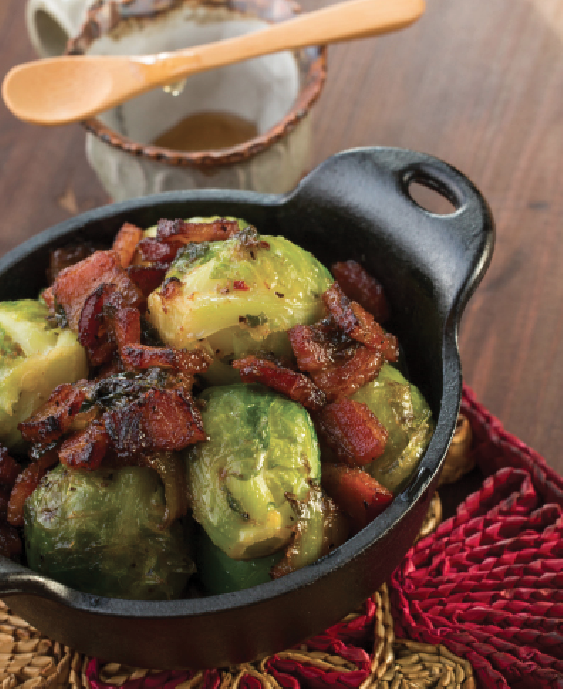 Brussel sprouts are delicious when paired with sweet local honey and quality thick-sliced bacon. Sweet and savory blend in this exciting spin on an old time favorite. While water is heating up, cut Bacon into 1/2 inch pieces, and in a large skillet, render bacon on medium-low heat. Once the fat from the bacon is fully rendered (should be firm, but not brittle), remove pieces and place to drain on paper towels. Leave as much of the bacon fat as possible in the pan, as it will be used later in the recipe. Once water reaches a boil, add 1 TBSP of salt. After, add Brussel sprouts to boiling water and let boil until tender, about 10 minutes. During this time, prepare a large ice water bath using a large mixing bowl, ice and cold water. Once tender, strain Brussel sprouts into a colander and immediate place colander and Brussel sprouts into ice water bath to stop the cooking process. Leave for 5 minutes and strain Brussel sprouts again. Preheat broiler to high setting. Heat the pan with remaining bacon fat over medium heat. Once the pan is hot again, sauté the Brussel sprouts to gain some caramelization and color, about 2 minutes. Using a slotted spoon, remove Brussel sprouts and place in an oven safe casserole dish or in a cast iron pan. Season with salt and pepper. Keeping the heat on medium, deglaze the pan with vegetable stock. Immediately add butter and honey. Reduce until the consistency of a syrup. Pour sauce over Brussel sprouts and top with set aside bacon. Place under the broiler until the tops start to blacken, then remove immediately. These cornmeal cakes are yummy, classic, and made from wholesome ingredients. We got the cornmeal for these at Murray’s Mill, which is a place you should visit. In large bowl, combine mashed, drained beans, along with cornmeal, soy sauce, paprika, garlic powder, mushrooms and red onions. Mix until all ingredients are incorporated and the mixture resembles the consistency of cookie dough. Heat up a large stainless skillet over medium heat and add oil. Using a spoon, dish spoon sized dollops of the batter into the pan and press them firmly with the back of the spoon. The skillet should immediately start to sizzle. Leave the thickness around 1/4-1/2 an inch and do not overcrowd the pan (no more than 4 corn cakes at a time). Reduce heat to medium-low and cook on each side for approximately 2 minutes per side. Once cooking is complete, remove onto a clean paper towel to dry and season immediately with salt. 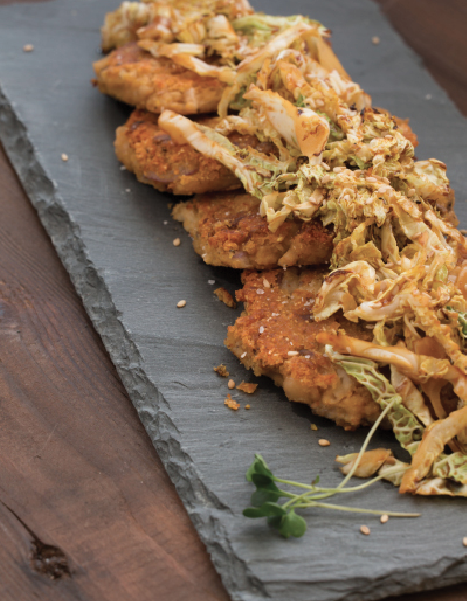 Once rested for at least a minute, move to serving platter and top with cabbage. Heat up a medium sized stainless skillet over medium heat and add oil. Toss in cabbage and sauté for 2 minutes. Add garlic powder and toss. While skillet is still hot, add soy sauce to deglaze plan. Toss and reduce until no more liquid remains. Serve immediately and garnish with sesame seed. 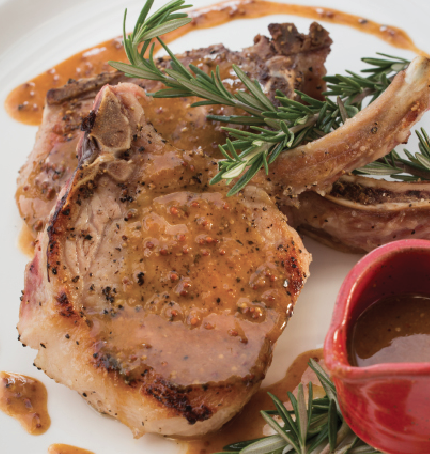 Many of the best dishes created in the foothills are centered on pork. 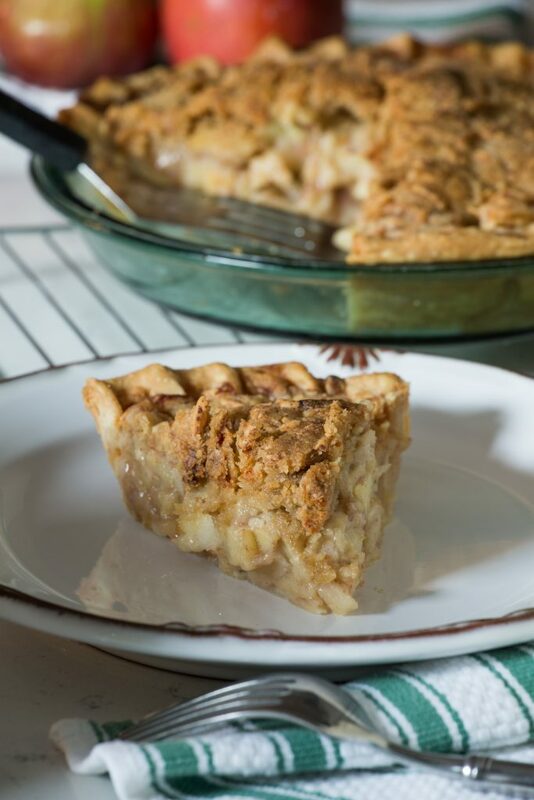 This delicious recipe is created by Calvin Reyes, new owner of the Henry River Mill Village and is a spin on recipes used during the Village’s hey day. A restaurant is coming to the Mill Village soon, and you’ll be able to taste Calvin’s creations first hand! Season both sides with salt and pepper and allow pork chops to come to room temperature before cooking. When ready, heat large stainless skillet over medium heat and add oil. Once oil is hot, place pork chops in pan and give a firm press to ensure property contact. Do not touch or move until searing process is complete. After 4 minutes, reduce the heat to medium-low. After about 6 minutes, a nice crust should form on the bottom side of the pork chop and it will release from the pan. Flip and sear on other side for 4-6 minutes, or until meat is thoroughly cooked. Once complete, remove pork chops from pan and allow to rest for at least 6-8 minutes before serving. For the sauce, return the skillet to Medium-Low heat. Deglaze the plan with hard apple cider and vegetable stock. Add butter, mustard, and garlic powder and whisk to incorporate. Reduce until sauce is thick enough to coat the back of a spoon. Plate pork chop and drizzle sauce on top. Deglaze is a fancy word that intimidates some folks. Don’t worry! It just means that you’ll pour cold liquid into a very hot pan that you’ve used to cook meat. What’s left in the pan is very flavorful and some of the world’s best sauces start with deglazing. You’ll add the Hard apple cider and vegetable stock, cold, to your hot pan, and stir, being sure to unstick the bits of meat and cooked goodness clinging to your pan. 1: Preheat over to 425F. In a large bowl, toss together the apples, sugar, flour, vanilla, salt and spices. Set aside. 2: Roll out the pie crust and fit into a 9 inch pie dish, trimming the edges and crimping if desired. 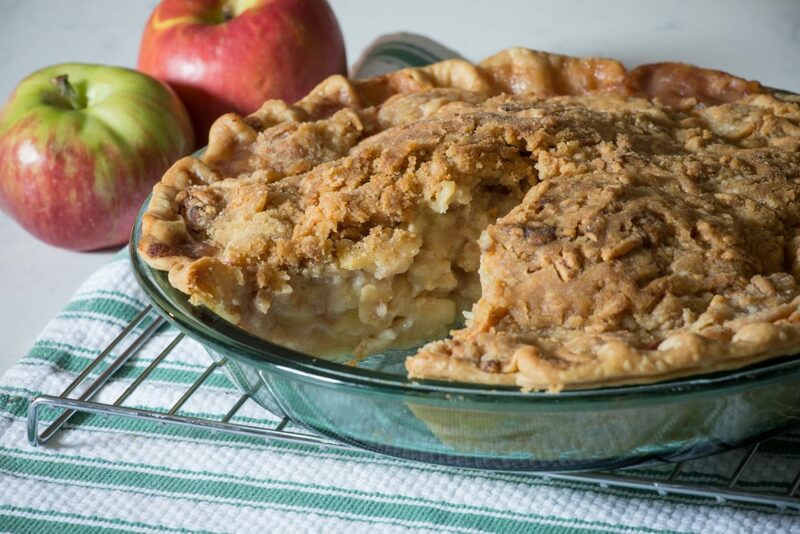 3: Pour the apples into the crust and arrange evenly. 4: In a bowl combine the flour & brown sugar and stir together. Stir in the grated cheese, and the butter, using your hands to work the butter into the dough, until small pea-sized crumbles form and the flour is worked in evenly. 5: Sprinkle the crumble over the apples.